A headset or UC conference unit from Corptel can bring Unified Communications to you. We offer a wide range of Jabra, Sennheiser, agent headsets and Logitech headsets and portable conference units offering USB, 3.5mm jack or Bluetooth connectivity. Because UC offers enterprise-level technology that transforms computers and business telephones into virtual communication platforms. By providing real-time communication through a combination of applications like IM (instant messaging) with presence indication, Voice over Internet Protocol (VoIP) and mobile devices you can achieve a versatility and flexibility in how you conduct your business. You can share documents and files, exchange ideas, and instantly edit a document together, transition to another device seamlessly throughout the work day or even right in the middle of a call. These new work flows mean UC frees you from the traditional desk and allows a transition to devices like your laptop and mobile, even giving you the flexibility to hold a portable conference wherever you are. One of the biggest benefits of UC is an overwhelming list of features, and while voice remains an all-important focus during the work day, allowing you to leave the desk when you need to, alongside features like instant messaging, synchronised calendars, work flows, and real time communications allow you to us work together better and can revolutionise the way we do business. Corptel are proud to announce our new agreement with Imago Scansource to supply the innovative range of IP conferencing from Phoenix Audio Technologies. Contact us today and we can talk you through these incredible products. Corptel went on the road in May, and partnered with Jabra to attend the Business Show 2015 at the ExCeL in London. The Business Show is links businesses with leading suppliers under one roof for a two-day event displaying the best of what’s on offer for both new business, and those looking to expand their reach. More than 25,000 business attended, and visited 350 exhibitors, 250 seminars and 15 free-to-attend masterclasses. Corptel's Jabra stand proved exceptionally popular over the two-day period, and the Jabra BIZ 2400 series was hugely popular with those looking to tune out colleagues and focus on customer interaction. The Jabra Stealth grabbed the attention of visitors to the stand because of its High Definition sound quality, portability and comfort. Visitors were impressed and showed great interest in its compact design and advanced noise cancellation. To find out more about how Corptel can help your business, contact our dedicated team of experts today on 01942 262 526. Corptel is very proud to announce a new and exciting agreement with leading American headset supplier VXi Corporation, to distribute their extensive range of VXi headset and Bluetooth products from 2015. This new relationship will see Corptel add VXi’s best-in-class, Avaya DevConnect compliance-tested headset solutions to its extensive portfolio of market leading products, giving Corptel customers across the UK and Europe the benefit of VXi’s industry-leading noise cancelling technology and exceptional sound quality performance offered by their headset solutions. VXi will gain access to a vast segment of new prospective customers across Corptel markets, as well as the unparalleled logistics capabilities and valuable customer knowledge provided through a relationship with Corptel. Back in 2012, Corptel was invited to become kit sponsor for the Billinge FC Under 6s team, and Corptel are delighted to be able to continue this support as the team enter a new season as the Billinge FC Under 9s this year. Corptel is proud to once again sponsor the annual 1940’s Swing Dance at RAF Cosford, which each year sees around 100 people come together in the exceptional setting of the Royal Airforce Museum to raise funds for Help for Heroes. 1940’s aficionados travelled from all over the country to attend the event which took place on Saturday 14th March. The crowd came together amongst the museums extensive collection of WWI and WWII planes to take part in afternoon swing dance lessons in exchange for a donation to the charity, before changing into period attire, adopting the war spirit, and joining the evening’s event. Guests were serenaded by a Manchester based three piece vocal harmony group, The Bobby Socks, who delivered a superb selection of 1940’s and 50’s songs to the eager crowd, many of whom took to the floor to show off the skills learned in the afternoon. Dinner was served to guests, before professional singer Amanda Beaumont took to the stage to entertain the generous attendees with her trademark 1940’s sing-along repertoire. Donations from the swing dance lessons, ticket sales, and a blind raffle that was held in the evening, enabled the night to raise more than £2000 for Help for Heroes, beating last year’s total by some margin. Various high profile companies have already adopted Agent as their headset brand of choice and for good reason; with exemplary feedback and now with the Avaya Devconnect certification, Agent has announced itself as a genuine competitor to the current market leaders. As one of the fastest growing brands in the UK, "Agent" is setting the standard for outstanding quality in today’s telecoms industry. With an estimated 3000 new users every month, we are quickly establishing a strong presence within the headset market and look only to increase this momentum going forward. Our high quality, cost effective headsets are now backed by the prestigious Avaya Devconnect Compliance certification. With the addition of this highly accredited certification we have instilled further confidence in our products, strengthened the brand and announced ourselves as a genuine competitor to the current market leaders. To achieve the Avaya DevConnect Compliance certification, headsets have to meet specific criteria and undergo a rigorous testing procedure testing features such as compatibility, sound quality, wearability and durability. We are pleased to announce the Agent 500 – 800 range of headsets passed all tests with flying colours and received certification on the 19th February 2013. Agent provides a full range of headsets and accessories at extremely competitive prices, which has seen the brand grow year on year. Agent aims to provide the dealer /telecoms resellers as well as end users with a high quality range of headsets, accessories and telephones which are all targeted to project a very attractive price point without the compromise on quality. Various high profile companies have already adopted Agent as their headset brand of choice and for good reason, with exemplary feedback and now with the Avaya Devconnect certification, we are confident our products will meet the majority of office and call centre requirements. 2013 has seen changes within the way call centres and office based businesses view headsets and their usage as a whole. With the growing adoption of SIP based telephony and current UC platforms, headsets have evolved from an add-on hands free tool, to an integral part of a businesses ability to communicate effectively and provide higher levels of customer service. The change in focus on purchasing decisions has seen more technologically advanced models being developed, with a higher focus on feature sets. Some of the standard features seen in today’s models are advanced noise cancelling, heightened clarity of sound and longer wireless range. These features have all become key players in the process of recommendation to users to address their specific headset needs and can determine the model type required to facilitate their needs accurately. One of the largest bug bears for a dealer/reseller/End User is the compatibility issues that come with headsets, one cable for one system and one cable for another, which can create confusion. However with the introduction of the smart cable from Agent this confusion is circumnavigated. These cross platform headset cables provide a higher level of compatibility with system phones used on platforms like Avaya, Nortel, Siemens and Cisco, as well as many others, reducing stress and potential headaches. Corpteluk is now an official Snom partner! Corpteluk are delighted to announce themselves as a new UK unified communications partner with Snom. We will be supplying Snom’s range of VoIP phones that are now qualified for Microsoft Lync, which will allow our customers to benefit from the high standard of modern business communications Snom produces. Snom is one of the primary developers and suppliers of VoIP telephones worldwide. It caters for all working environments, from lone workers in small home-run businesses to grand corporate offices with many different departments. Whatever the situation, users can take advantage of a vast array of products, all of which will be compatible with SIP-based telephone systems. With the unveiling of the world’s first SIP telephone in 1999, closely followed 12 months later by its innovative SIP stack and plug-and-play mechanism for Snom phones, Snom has positioned itself as one the best VoIP endpoint suppliers around. The more recent Snom 821 UC model is a great example of Snom’s ability to give users a personal experience. This model can be programmed to the user’s needs, with the option of displaying their own logos and images on the home screen, configuring dedicated feature buttons and receiving video streams from entry phones. Snom is currently the only IP phone manufacturer in the world offering compatible IP phones for Microsoft® Lync™; the UC (unified communications) interface which unites voice communications, IM, audio, video, and Web conferencing into a richer, more collaborative offering. The Lync communication platform is directly accessible from Microsoft Office programmes such as Outlook, Word, and SharePoint and delivers a cleaner, more efficient user experience. Other manufacturers offer ‘Lync optimized’ models, but they will be exclusive to a Lync environment and inoperable on other platforms. 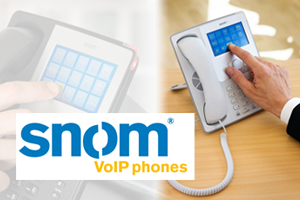 Snom IP phones are different; they are flexible and will work in non-Lync environments too. This will ensure you can use your phones from the get go, with any full or partial Lync installations running alongside your current SIP phone system. With Corpteluk now able to boast the inclusion of Snom’s excellent and reliable range of VoIP phones in our portfolio, we can offer businesses of any size a secure, reliable and flexible option when considering their next investment in VoIP telephony equipment. Future Snom devices will continue to build on making the user experience as secure and personal as possible; your company can be one of the first to benefit from this. Single or dual? Wireless or corded? The headsets you choose could be the difference between your business being a noisy, stress-riddled room or a streamlined, efficient place of business. But how do know which is the best choice for you? Headsets in today's market are sleek, lightweight units, with advanced technological features that provide workers with varying levels of assistance. A cordless headset affords the user such luxuries as being able to send faxes, collect printed documents, and move freely around the office and cantine whilst still speaking hands-free to a client. A corded headset doesn't permit the user as much freedom, but still allows them to take notes, look up information, all with the added bonus that it does not require batteries and will in some cases be more comfortable than a cordless unit. However, new and improved wireless headset designs - which provide reliable, all day comfort - are constantly being deployed. This aspect of the headset design may not be a critical deciding factor in the purchasing process for much longer. The choice of headsets for your company depends entirely on the dynamics and nature of your business and whether or not you think certain technologies are worth investing in. The right choice of headsets by a company can transform a noisy room into a streamlined and efficient place of business; the wrong choice of headsets can turn it into a stressful and unproductive environment. If you're considering buying wireless, it's advisable to research how much the quality can vary. You should consider how much your business would benefit from wireless headsets for the extra costs incurred. If you buy a lower end cordless headset for the same price as a higher end corded headset, there will be a lower quality of sound and your recipients might be left unsatisfied with your service as a result. If your employee is mobile for only a couple of hours in their working day, it may not be worth the leap to wireless. Assessing the typical working patterns for each of your employees should determine whether the role of the individual requires a higher level of mobility. If so, it should also establish whether the labour costs saved in their added mobility (eg. collecting print outs and sending faxes whilst taking a call) will outweigh the extra costs of a more advanced headset. As the technology of headsets continues to develop, efforts are likely to be concentrated on improving the versatility of wireless headsets i.e. increasing the range, eliminating problems of static/shock and seeking innovations in design to make them more comfortable. Bluetooth technology is an increasingly popular choice for wireless headset users, but it might be some time before functionality, safety and sound quality catches up the novelty and style of bluetooth and other wireless technology headsets such as DECT (Digital Enhanced Cordless Telecommunications). Video conferencing is going down in price and up in quality. Could your company benefit from this cost-saving, environmentally friendly alternative to business trips? The video conferencing market is growing. Teaching institutions, health care facilities, home-run businesses and corporate businesses are all benefitting from it. In economically unstable times, it is an attractive alternative to expensive business trips, an alternative which managers can't ignore. And thanks to the Internet, the technology is coming down in price whilst improving in quality, allowing the market to flourish. Leading brands such as LifeSize and Polycom have been working on the technology for years to make issues such as unreliable connections and delayed images a thing of the past, and they have been largely successful. productivity and above all, it saves time. More often than not, clients will be able to spare an hour for a video conference but won't be able to give up their day travelling to a meeting. The nature of the meeting or conference obviously dictates which is the most appropriate form of communication, but with a video option available, unnecessary costs will be kept down to a minimum. Video conferencing is not as effective as a face to face meeting when it comes down to the hard sell; striking that deal and sealing it with a handshake. But it is an economically viable and environmentally friendly option - one which there will be always be a market for- so it is a good idea to research options and expand your business with this technology. Whether you're interested in saving time, saving money, or reducing your carbon footprint, video conferencing could well be a step in the right direction for your company. Audio conferencing allows you to be in several places at once; working from your office at home, conducting a meeting in the boardroom or striking a deal with a client on the other side of the world. With travelling no longer a necessity, everyone involved in the audio conference has more time to spend productively instead of waiting for trains, planes or automobiles. Time is saved, less money is spent and more goals are accomplished. To join an audio conference, participants typically call a toll-free number, verify their entrance code and enter a virtual room where customers, clients and managers in different locations can converse as though they were sitting in the same office. 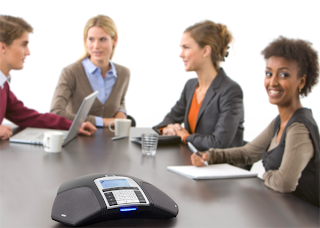 Advanced systems from the likes of Konftel and Polycom can automatically record conferences, schedule calls, mute or un-mute participants and dial out to other parties during calls. The latter example is particularly useful in call centre scenarios. For example, when a customer requires technical assistance a sales person is unable to provide, the sales person can dial out to a technical advisor and bring them into the call. Without audio conferencing and only one line available, the customer would be passed around or left waiting and their experience would be less than satisfactory. In the business world, investing in audio conferencing technology has obvious financial incentives, but what about making the 'step-up' to video conferencing? Is it worth it? If money saved on travel costs does not outweigh the hefty investment made on equipment, then the answer is no. But doesn’t the video element put forward a slick, professional image for the company? The notion that video conferencing creates a more affluent business purely because face to face dealings are more effective is debatable. Face to face meetings will on occasion be more preferable for those involved, but the advantages of being able to see the people you're doing business with can't truly be measured against the personable, persuasive skills of those who only have access to audio conferencing. A conference will only be worthwhile if participants communicate with each other effectively, and video conferencing will not necessarily improve an individual's interpersonal skills. 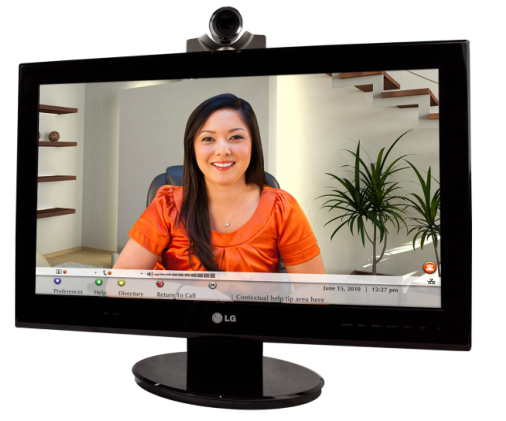 Video conferencing does offer a much more interactive and visual experience than it's audio counterpart, but it requires expensive equipment, a reliable maintenance service and a strong broadband connection. The high speed and capacity required to sustain a video conference restricts attendance to just a handful of members. Audio conferences can include hundreds, even thousands of participants. The only requirements for each member are a computer terminal and a reliable Internet connection, not necessarily a high speed one. Whether or not a company should stick solely to audio conferencing or branch out with investment into video conferencing, depends entirely on the budget, the size and the needs of the business. There's no doubt however, that audio conferencing is a great solution for any company who needs a cost-effective, simple and reliable way to conduct business. You know talking on your cell phone while driving is dangerous. Reports have shown that using one in the car can lead to slower response times, because they cause such a big distraction. In many countries and states, the using a cell phone without a handsfree device has even been outlawed. So, you have finally decided to get your voice out there. Maybe you’re starting your own business, maybe you just want to help others with common problems, or maybe you just want to chat with long lost friends. Whatever the reason, you have decided to host a webinar. The only problem is, you don’t know what your audio options are. Can you use a landline phone? Should you be using a handsfree headset? Everyone loves technology. Whether it’s a new CD burner, music player, or a headset for your computer, your PC gadgets can provide you with plenty of convenience and hours of entertainment. The best headsets offer clear audio, are comfortable to wear, and filter out background noises, making them extremely functional pieces of technology. Is your company thinking about purchasing new headset phones for your office? If you are in charge of finding the best headsets online and purchasing them for your employees, there are a few considerations you must think about first. This is an expense that should not be taken lightly, as your employees will use them every day to communicate with customers. 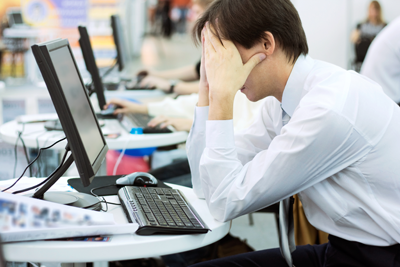 Is Your Workspace Affecting Your Health? Working behind a desk used to be considered one of the safest occupations. Because really, what can you do to yourself sitting in front of computer. Many new studies have begun to show this type of work can, in fact, be harmful to your health. What causes hearing loss? According to the American Speech-Language-Hearing Association, or ASHA, there are several different reasons adults can experience hearing loss if they did not inherit it. Some of the most common are illnesses, tumours, head injuries, ear-damaging drugs, aging, and loud noise. So, How Exactly Does VOIP Work? These days, you have access to many different types of technology, and while some of it may be new, confusing, and exciting at first, you will find it eventually plays a big role in your daily life. Take VoIP for instance. Right now, you may not even realize what this acronym stands for, but there is a good chance you use it almost every day without even knowing it. Unified Communication from CorptelUK is cross platform system that is taking VoIP (Voice over Internet Protocol) to a whole new level. This technology transforms computers and regular business telephones into virtual communication platforms. It allows users to communicate with other individuals via a hands free headset in real time, even though those individuals may live halfway around the world. Are you considering using Skype for your home business? When it comes to communication for business, Skype is a tool you just can’t do without. It has a variety of impressive and useful features that allow you to check in with your business partners, send files, make international calls, and hold video conferences with potential clients. Why Do You Need a Voice Tube for Your Headset? A headset with a voice tube is much different than a noise-cancelling headset. The most significant difference, of course, is that a voice tube doesn’t cancel out any background noise. When used in a noisy environment, the caller on the other end of the line can hear everything in the background. On our Corpteluk blog, we have discussed many different headset attributes, benefits, and uses. From headset safety to using microphone headsets for your home office, it may seem like we have covered every possible subject.